The ADI team have returned from Strasbourg shocked as MEPs vote to reduce significantly proposals from the European Commission to regulate animal experiments across Europe. Tim Phillips, ADI Campaigns Director who was in Strasbourg for the vote commented: "There has been a sustained campaign of misinformation from bodies only interested in a supply of cheap monkey regardless of welfare cost. There is clear evidence of the horrific suffering of monkeys torn from the wild and also serious issues concerning depleting wild populations, and destabilising wild populations through the removal of large numbers of females." 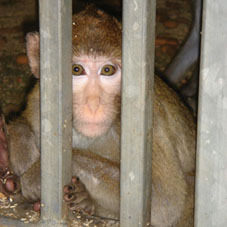 Over 10,000 primates die in European labs each year and an estimated 10% of EU lab primates are taken from the wild. Nearly half (48%) of the world’s primates are in danger of extinction according to the ICUN. The extinction threat nearly doubled in a year - from 26% in 2007. Primates are important to the health of their surrounding ecosystems. Through the dispersal of seeds and other interactions with their environments, primates help support a wide range of plant and animal life in the world’s tropical forests. Healthy forests provide vital resources for local human populations, and also absorb and store carbon dioxide that causes climate change. The full investigative ADI video ‘Save The Primates’ is available to watch here. Brian Simpson Labour MEP for the North West agrees: "My position has always been one of opposing experiments on animals. However, we need to ensure that any such experiments are strictly controlled, that no primates caught in the wild can be used and that any use of offspring from wild caught primates is phased out within 7 years.